House lawmakers on Thursday voted to temporarily bar the transfer of Guantanamo Bay detainees from the United States and foreign countries, in defiance of a veto threat from the Obama administration. The House voted 244-174 to approve the Guantanamo Detainee Transfer Prohibition Act, which would prohibit the use of federal funds to transfer detainees at the Guantanamo Bay Naval Base, Cuba, to foreign countries or the United States until the National Defense Authorization Act (NDAA) for next fiscal year is signed into law or until the next president takes office. The bill’s passage is poised to heighten tensions between lawmakers who oppose President Obama’s efforts to shutter the detention facility and the current administration. Obama has accelerated his push to close the prison in his final year as president, transferring dozens of prisoners to foreign countries this year and delivering a plan to Congress that would involve moving detainees not approved for release to federal prisons inside the United States. Current law bars the Defense Department from using federal funds to move prisoners to the homeland. The bill was introduced in May by Rep. Jackie Walorski (R., Ind. ), a member of the House Armed Services and Veterans Affairs Committees, and had accumulated 78 cosponsors when it went to the House floor for debate. "These are terrorists, they’re not Americans," Walorski told the Washington Free Beacon in an interview Thursday morning ahead of the vote. "I believe the president is putting a political campaign promise above the safety of Americans." The Obama administration threatened to veto the legislation earlier this week, describing it in a statement as "an effort not only to extend the facility’s operation—as have the other unwarranted legislative restrictions on transfers—but to bring to a standstill the substantial progress the administration has made in safely and securely reducing the facility's population." The administration has argued that Guantanamo Bay undermines national security and serves as a recruitment tool for terrorists. Critics of the president’s plan have pointed to assessments from the director of national intelligence that indicated in March that over 200 former Guantanamo detainees are either confirmed to have rejoined terrorist activities or are suspected of doing so, which represents roughly 30 percent of prisoners who have been released from the military prison. Ahead of Thursday’s vote, the U.S. intelligence community released updated assessments confirming that two additional militants released from Guantanamo Bay had rejoined terrorist activities during the first six months of 2016, Reuters reported. Walorski said that the latest revelation put an "exclamation point" on the issue of ex-Guantanamo detainees rejoining terrorism. "This keeps happening and [Obama] can’t keep it from happening," she told the Free Beacon. The administration completed the largest-ever prisoner transfer last month when it transferred 15 detainees, including a member of an al Qaeda-linked bomb-making cell, to the control of the United Arab Emirates on Aug. 15. Republican members of the House Permanent Select Committee on Intelligence wrote to Obama criticizing the transfer, arguing that it endangers national security and U.S. troops operating abroad. "As you continue to draw down the prisoner population at Guantanamo Bay, you are releasing increasingly dangerous terrorists who are more closely linked to al-Qa’ida and attacks against the U.S. and coalition forces in Afghanistan," the lawmakers, led by intelligence committee chair Rep. Devin Nunes (R., Calif.), wrote last month. "This largest-ever release includes several who trained in al-Qa’ida training camps, were bodyguards for Usama bin Laden, and fought at Tora Bora. They were non-compliant with their interrogators and hostile towards the Joint Task Force Guantanamo guards," they wrote. The administration announced the Aug. 15 transfer after the Washington Post reported that at least 12 former Guantanamo detainees had committed attacks on U.S. or allied forces in Afghanistan, killing roughly a half-dozen Americans. 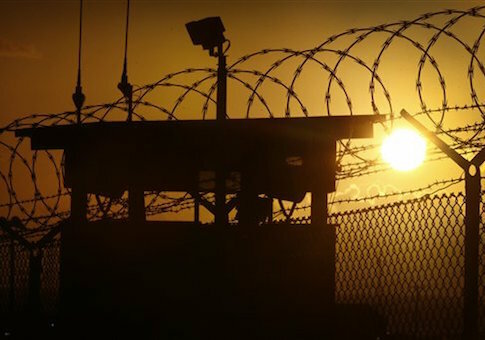 The prison population at Guantanamo Bay has been whittled down from a peak of nearly 800 detainees during the George W. Bush administration to 61, and the Obama administration intends to transfer at least 20 current prisoners elsewhere. Walorski and other Republican lawmakers have described the remaining detainees as "the worst of the worst." The House and Senate versions of the fiscal year NDAA include provisions that would prevent the closure of Guantanamo Bay. Obama has threatened to veto both versions. The White House has not officially ruled out pursuing executive action to close Guantanamo, though reports have indicated that Obama is unlikely to do so. Walorski said Thursday the use of executive order would be unconstitutional and represent a "major overreach" by Obama. The bill temporarily prohibiting the transfer of prisoners from Guantanamo will now head to the Senate, where it will be more difficult to pass. This entry was posted in National Security and tagged Al Qaeda, Guantanamo, House of Representatives, Obama Administration. Bookmark the permalink.